Who isn’t fan of the beautifully written world famous Harry Potter series. These books takes us to the magical journey of a whole different world. But nobody knows the real struggle of its author before creating this magical story. 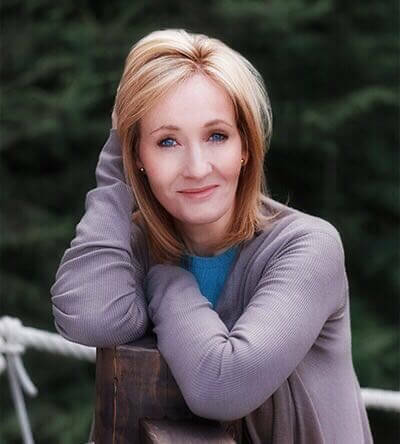 J.K. Rowling, the author of iconic bestselling Harry Potter series, a teacher, producer, screen writer, philanthropist, novelist and first writer to became billionaire. She was born in 1965 in Yate, Gloucestershire, England. When other kids of her age used to play outside, she was always surrounded with books. She used to live in books, she started writing fantasy stories at very young age. Rowling wrote her first book when she was just 6 years old and named it Rabbit. Her mom was digonesd with multiple sclerosis and she couldn’t take her mother’s pain. To escape this harsh reality, she started losing herself in books and started writing. Her dream was to study at Oxford University but she got rejected. She enrolled herself in University of Exeter. She picked up small jobs on temporary basis, but she always wanted to Pursue career as author. She had 2 novels but they never sold out. Her family and friends started getting tensed about her career, they advised her to quit writing and focus on something else, as she was not making any money out of it. Suddenly, in 1990, a rough idea of young boy attending his school of Wizardy striked her mind while traveling a train from Manchester to London. And she immediately started writing this after reaching home. She wrote first three chapters of book but before she could complete fourth chapter of her book, she got the biggest shock of her life, her mother passed away. The author lost her mother at age of 25, and this incident Shatterd her badly. In 1992, she left the country to run away from her sadness. She went to Portugal and started teaching English. Soon, she got married. She suffered from a miscarriage and later gave birth to a daughter named jassica. But her marriage didn’t last long, and she got divorced within 13 months. After her divorce, she felt lost and didn’t have any idea what to do next. She moved back to Edinburgh. She was lost jobless, poor and depressed single mother living in a mouse infested house in Britain. People called her failure and she felt they were right. Rowling relied on state welfare benefits. She fell into deep depression. She became afraid of living and considered to commit suicide. But concern for her daughter didn’t allowed her to take that harsh step. She took medical help for her depression and decided to direct all her energy in writing her masterpiece. She started spending most of her time writing harry potter in a cafe with her daughter sleeping in a pram next to her table. She gave a pie of her own personality to each and every character of her story. And one of the most admired characters of series, Hermione Granger was fully inspired by life of her own younger self. Being poor, Rowling couldn’t afford a computer. So she manually typed whole novel of 90,000 words by herself on her old typewriter to send that to publishers. She sent her manuscript to 12 publishers but each one of them rejected her script. She started losing her confidence in her writing and started to teach again to feed her daughter. After a year, to her surprise, Bloomsbury publishing house in London, gave her book a second chance after the 8 years old daughter of their chairman became fan of her book and wanted its next part. However, the publisher advised Rowling to continue her job, as she couldn’t make enough money with child’s fantasy book. In 1997, her first book HarryPotter and Philosopher’s Stone was published. After five months, her book won first price Nestlé Smarties. She also won British book award for children book of the year. Her first book won British Children Book of the year in 1998. In same year an auction was held in United States to sell the publishing right of her book. Scottish Arts Council purchased rights in 8000 grants. In next year, the bestseller author again won Nestle Smarties price for next part of book called Harry Potter and Chamber of Secrets. Her third book Harry Potter and the Prisoner of Azkaban also won Smarties price making her the first person to win this price three times in a row. The filming rights of her first two books were purchased by Warner Bros. Rowling reviewed the scripts and acting of films. Rowling made sure that movie was kept close to the book. By July 1999, she earned $480 millions with her three books. She won National Children’s Book of the Year award for “Harry Potter and Chamber of secrets”. Her fourth book Harry Potter and the Goblet of Fire broke all sales records in US and UK and became the fastest selling book of history. Approximately, 3,72,775 copies were sold on first day. Rowling was named author of the year in British book awards twice in 2000 and 2006. In 2001, film based on her first novel “Harry Potter and the Sorcerer’s Stone” was released and broke all box office records. J.K. Rowling’s sixth novel again broke records. In just 24 hours, nine million copies were sold. Her seventh novel Half blood Prince won the book of year prize at British book award. She was named first billionaire author and second richest female entertainer by Forbes in 2004. She became 1062th richest person in the world. In 2010, movie released on her seventh book and just like previous movies of Harry Potter series, it was again a blockbuster hit. Harry Potter movies are financially most successfull films in history beating the most successful film series like Star Wars and James bond. It’s not easy to write such books with large number of characters. Each and every character whether small or big, has its own importance and unique noticable character. She built an exciting magical world for kids. Not only kids, today, people of every age groups, across the globe are in love with Harry Potter books, theme park and movies. J.K.Rowling founded charitable trust which has annual budget of $6.79 millions. She donates great amount of her income to help poor to achieve their dreams. J.k. Rowling could have committed suicide to escape all the difficulties, but she decided to fight against all the odds. She directed all her energy in doing just one thing, which she can do better than anybody else and rest is history.